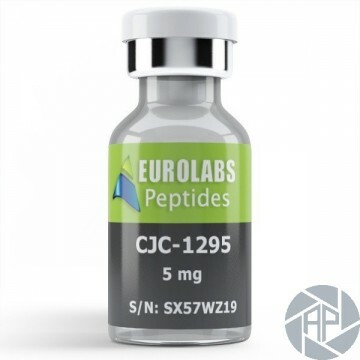 CJC-1295 is also referred as “Drug affinity complex growth releasing factor” abbreviated as DAC-GRF. It is a synthetic derivative of GHRH (Growth hormone releasing hormone) and available in the form of injectable peptide. Its sole objective is to increase the secretion of growth hormone alternate with corresponding pulses of somatostatin leading to the release of growth hormone inhibiting hormone. It basically promotes the release of IGF-1 and aids in fat loss and improved muscle gains. Its first clinical research experiment was piloted in mid-2000s and it became successful in reporting the fact that HGH production increased the rate of lipolysis (lipid breakdown) that resulted in the gut fat loss in obese patients of AIDS. The optimal dosage for CJC-1295 is 1000mcg once or twice a week. It has a half-life of almost 7-8 days due to which it stays in the blood stream and helps to increase the level of GH in blood plasma 2-10 times within 6th days of injection due to which lean muscle mass is achieved and after 8-9 days a marked increase in IGF-1 is also observed. The duration of the course is comparatively shorter and can last up to 3-4 weeks. If 1000mcg dosage is required then volume will be 1 mL and insulin syringe marked with 100 IU should be preferred. The drug is then administered subcutaneously (deep into the skin layer), intra-muscularly (deep into the muscle) and intravenously (through vein) as per preference of the user. CJC-1295 modified form is usually stacked with GHRP-6 (growth hormone replacement peptides) for getting better results in terms of lean muscle mass, protein synthesis and loss of fat. If one injection of GHRP-6 is administered at night then it will not cause an increase in cortisol or prolactin. Mild water retention can occur at higher doses. Skipping a dose and less sodium intake will solve this issue.